It's not every day that I get to meet so many influential people in the Recruiting/Social Media world to discuss topics that I am so passionate about - and that day was fun! Michael Long @theredrecruiter - It's not about finding "Top Talent" - It's about finding the "Right Talent" for your company culture. Retention starts at the sourcing stage. Identify what your true company culture is (warts and all) and then encourage the people in your company that is walking/talking examples of your culture to share (blog/talent community) why they love working for your company. This will give potential hires the chance to really see what your company is all about (Not just what the Marketing Dept wants posts on your website) and enable them to self-select if they want to join your team. Now all that is left if for them to apply and the rest is easy. This is how you attract and retain the "Right Talent" for your company. William TinCup (@willamtincup )– Great thought about Brand Drop off. More to come…. Panel on Talent Communities - “Talent communities! It’s all about building a Talent Community…” – I’m a little tired of all the TC talk. It seems to me that “Talent Community” is used to describe everything from CRM’s, Email Newsletter Lists, and Applicant Tracking systems but rarely do these solutions have a real “Community” at all. Yes, there are a few exceptions but you know what I mean. I don’t think you need a new expensive platform to create a “Talent community”! Get a facebook fan page (free), Start a LinkedIn Group (free), use Ning (like 19.95 a month) , or just a blog with comments and forum. In other words, bring community and engagement to the table and you will have a win, you can’t buy your way into the game and win. Someone must be 100% committed to the community. SocialBro.com, Work4labs.com, getajobgram.com, Com,Tweepi.com,Lists.ly,Crowdbosster.com,YourOpenBook.org, Tweetgrid, Visual.ly (coming soon) tool for free Infographics building. Some cooler recruiting tools here. Thanks to Craig Fischer @fishdogs for the invite and putting on a good show! I think the people at Dice #DiceConnect really get it! “You Betcha” Pinstripe! The Pinstripe team was there in force and seems to have a lot of passion and knowledge in the Social Media, Sourcing, and recruiting space. Angela Hills @angelahills, Allison Gugala @aguala, Bethany Perkins @Bethanyperkins. 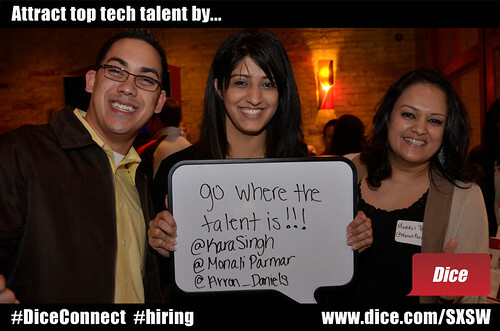 Quote from @KaraSingh, @MonaliParmar, and @Arron_Daniels at TalentNet Live at Iron Cactus. SXSW Interactive 2012. March 9, 2012. Kara Singh (@KaraSingh), Arron Daniels @arron_daniels, and Monali Parmer @MonaliParmer represented Insperity well, Cool group! 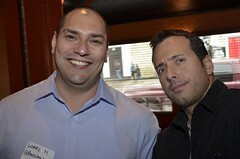 Marc Mapes @marcmaps - http://hirematch.me/ - Good times. Bill “The Madhatter” Boorman @BillBoorman – thanks to taking the time to explain the details and tools you used to pull off the most amazing Facebook hiring event on the books! Take a look at some RecruiterLarry's video recruiting tips and tricks. Thanks for the mention Larry! It was a pleasure meeting you.